At Party Pronto, we have a variety of attractions for the 6 and under crowd. Tiny Tots are our specialty and we love to help with those 1st birthday parties. Our Tiny Tots Playgrounds are inflatables that are larger than standard jumpers. They are slightly bouncy with built-in ball ponds and small slides. They’re available in a number of classic themes as well as cartoon character themes. Those include; Big Top (with a clown and circus theme), Chopperville (with a helicopter), Disney Princess Tiny Tot Castle, Elmo and his Sesame Street friends, Farmland, Hello Kitty, Mickey and Friends including Minnie Mouse, and Toy Story. If you want something a little smaller, we suggest the Ball Pond mini jump which is smaller than a standard jumper and has an open top. This unit is small enough to fit into your garage. It’s 2/3rds jumper and 1/3 ball pond with a recessed floor. 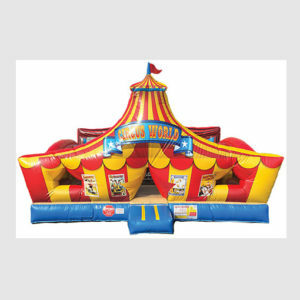 We also offer the Galaxy Explorer (obstacle course with pop-ups) and Morphy the Caterpillar (pop-ups and small slide). Our Trackless Train and Fire Engine offer fun for kids and adults alike. Ride along with your children – we provide the driver. These units are built can fit on a quiet street, a parking lot or even the sidewalk. We also have Merry Go Rounds (Carousels) that are either pedal power (the kids use tricycle pedals to make it go around) or mechanical (using a standard 110 electrical outlet). 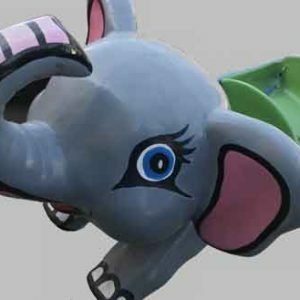 Our single or double Swing Chair Ride, Airplane Rides, and kid-sized Whip ‘O Whirl are popular for home, school, church or community events. We also have a Tiny Tots train with track that will fit in your backyard. Our Elephant Ride is adorable with four elephants that go around in a circle. For our mechanical rides, we supply an operator.